Only Liberace has more glitter. REEL Metallic Enhancement Powders were created to enhance the REEL Metallic Airbrush Kits and REEL Metallic Palettes. The REEL Precious Metals Enhancement powders (Stack#1) come in a stack of 10 different colors and match the Precious Metals Airbrush kit and the REEL Highlighter Metallic Palette Kit. Have you run out of a favorite color and you need more? 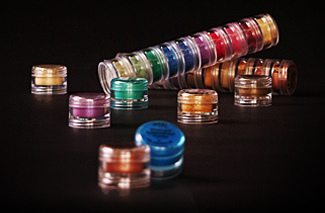 Never fear as we have all of our REEL Metallic Enhancement Powders available in individual color refill jars. The REEL Shimmer Enhancement powders (Stack#2) come in a stack of 10 different colors and match the Totally Metallic Airbrush kit and the REEL Highlighter Metallic Palette Kit. The REEL Enhancement Powders have the same pigments used in all of our REEL Metallic Inks so there is no metal in them. Includes both REEL Metallic Enhancement Powders (Stack #1) and REEL Shimmer Enhancement Powders (Stack #2).